Strongly believed to bring protection & balance.Obsidian is a naturally occurring volcanic glass formed as an extrusive igneous rock. In the Stone Age Obsidian was highly valued as it could be used to produce sharp blades or arrowheads. 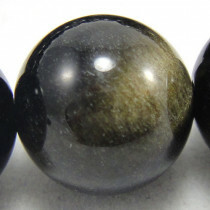 Golden Rainbow Obsidian Gemstone Round 4mm Beads (~100pce Strand) - 40cm /16'" Strand. 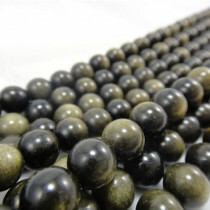 Golden Rainbow Obsidian Gemstone Round 8mm Beads (~50pce Strand) - 40cm /16'" Strand. 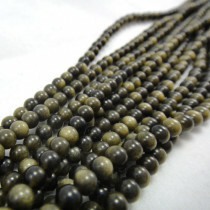 Golden Rainbow Obsidian Gemstone Round 6mm Beads (~66pce Strand) - 40cm /16'" Strand. 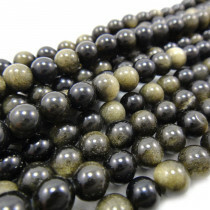 Golden Rainbow Obsidian Gemstone Round 10mm Beads (~40pce Strand) - 40cm /16'" Strand. 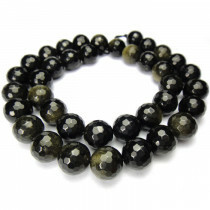 Golden Rainbow Obsidian Gemstone Faceted Round 10mm Beads (~40pce Strand) - 40cm /16'" Strand. 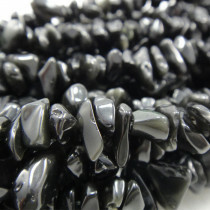 Obsidian Stone Chips 5x8mm (~160pce Strand) - 91cm /36'" Strand.